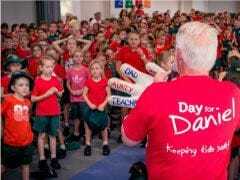 Thousands of children learned how to Recognise, React & Report and wore red for Day for Daniel, Friday 27 October. These are just some of many great photos from around Australia. Thank you! We are incredibly humbled and proud of what we have achieved thanks to your amazing support.